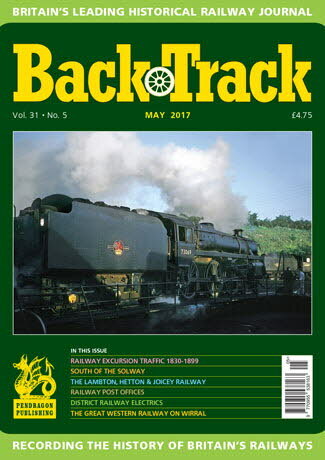 Railway Magazine | BackTrack May 2017 journal from Pendragon Publishing. Railway Post Offices - a survey by Alistair F. Nisbet of country stations which had a post office as part of their facilities. The Lambton, Hetton & Joicey Railway - Glen Kilday recalls a youthful visit to this Co.Durham colliery system and looks at industrial railway development in the area. Back to the Settle-Carlisle line - archive photos to mark the reopening of this famous route after flood damage. Dublin Amiens Street - in the Rare Ould Times - colour spread of steam power and diesel railcars in the 1950s/60s. South of the Solway - David Joy describes the incursion of Scottish railway companies into NW England around Carlisle and Cumberland. Carnforth and Cumbria - five pages of colour by David Rodgers of steam in its closing weeks in 1968. District Railway Electrics - Michael J. Smith tell the story of the Metropolitan District's sub-surface stock. The Great Western in Wirral: Part One - Tony Robinson investigates how the GWR gained its northernmost outpost on the Mersey in Birkenhead. Signalling Spotlight: Scottish Signal Variety - pre-grouping survivors photographed in colour and described by Richard D. Foster. Railway Excursion Traffic 1830-1899 - Jeffrey Wells looks at how 'leisure' travel grew during the Victorian era. Go West - three colour shots of steam in Somerset, Dorset and Devon.